There are many fantastic resources available for use during Seaweek. We have listed those useful for teachers and others, so check out the downloads, ideas, references and links below. For more information see our links page to see what else is happening around New Zealand and the Globe. Scroll down the page to find even more fantastic resources from previous years. Thanks to NZ On Air and children’s entertainer Chris Lam Sam Young Ocean Explorers are proud to be launching their first ever song and music video collaboration for 2-6 year olds, specially for Seaweek 2019! This is the beginning of something awesome for our youngest tamariki. All you need to do is press the CC button at the bottom of the video (choose captions), as in the photo above and click English, for the subtitles to appear as the video is playing. The New Zealand Herald in association with the Hauraki Gulf Forum is proud to bring you the 2019 Hauraki Gulf Marine Park Poster, inserted inside the Herald free to you on Friday the 1st of March. You can also pick up a copy from the following libraries: New Lynn, Onehunga and Mahurangi East. The 2019 poster highlights the vast scope of the Hauraki Gulf Marine Park, scaling the boundary; where it begins and ends. Discover the diversity of life from land to sea as we delve into the Hauraki Gulf / Tīkapa Moana, the array of creatures, terrestrial and marine, who inhabit the Gulf, and threats to them like sediment and overfishing. Illustrated by internationally renowned artist Dave Gunson. In return the Endangered Species Foundation asks school principals to nominate candidates for the new club. Life Between the Tides is a new poster produced by the New Zealand Marine Studies Centre. It illustrates the strange and amazing marine animals and plants that are found on the rocky shore and in rock pools at low tide. Sixty-three species are included in the image. Will you be able to find them all? The poster is designed to be printed at 84cm wide x 30cm tall. The key gives common, scientific and Māori names. If you require multiple copies please contact the New Zealand Marine Studies Centre. Working with Corlis proved to be very rewarding. When she was here in Dunedin as an intern, it was evident that she was not only an extremely talented artist, but also very dedicated and astute. We described the project we had in mind – and she just got it and ran with it. When the Centre was looking for an illustration for its “Aquavan” in 2017, they turned to Corlis, and she reworked elements from the colour cover of the Rocky Shore colouring book to make it suitable for a full wrap for the Aquavan. As she lives in California she has never seen the colourful Aquavan on the road, but her work has brought marine life to the attention of thousands of people in New Zealand. The idea of a poster about the Rocky Shore had been in our minds for some time, and we were delighted when Corlis agreed to be our artist. It is not always easy to work with someone at such a distance, but we knew that Corlis would do a great job – and she has! The printing of the poster has been kindly supported by Mobil Oil. My name is Corlis Schneider and I love illustration. I live in the USA, but in 2011 I travelled to Dunedin, New Zealand for my CSU Monterey Bay science illustration internship at the then Portobello Aquarium. I illustrated The Rocky Shore colouring book for the Marine Science Institute, as well as their colourful van wrap. I have a bachelor’s in marine biology from UC Santa Cruz, so coming to Dunedin to illustrate the marine life was a real treat for me. The latest piece, the species-packed, watercolour poster was done remotely. Many thanks to Sally Carson, Tessa Mills, Rod Morris, and more, for the excellent resources and collaboration. Dunedin is one of the most beautiful places I’ve been to, with wonderful people. I enjoyed my time there, and I hope you will enjoy the work I have left behind. I live on a California ranch with my husband, two children, our many horses, goats, and one llama. For more of my work visit my webpage www.corlis.org or follow my life and art on Instagram, HighNoonWesternArt. 19 to 21 February 2019. This Marine Reserves virtual field trip is an ideal lead-up to Seaweek and will let you see first-hand how 25 years of protection have allowed the undersea world to flourish. Explore biodiversity above and beneath the waves, including native and endemic species. Learn about spin-off activities like tourism, fishing and diving, and how they are managed sustainably. Go out on a boat and take some great photos and videos underwater. Get to know rangers and scientists who work to help keep the marine reserve full of life. Free for schools to enrol. Find information on marine pests in New Zealand waters. Search collated national data and read about research and management of marine pests in New Zealand. The Secretariat of the Convention on International Trade in Endangered Species of Wild Fauna and Flora (CITES) and the United Nations Development Programme (UNDP), working closely together to facilitate the global celebration of next year’s United Nations World Wildlife Day (3 March), announced the theme of World Wildlife Day 2019: “Life below water: for people and planet”. World Wildlife Day on 3 March 2019 aligns closely with UN Sustainable Development Goal 14 – Life below water, which focuses on marine species, and will be a chance to highlight the crucial importance and value of marine wildlife to our everyday lives, to celebrate successful initiatives to conserve and sustainably manage these species and to scale up support for such initiatives. World Wildlife Day 2019 will be marked by a series of events and media activities around the world, including a high-level event at UN Headquarters in New York on 1 March (Friday). As part of these activities, CITES and UNDP are also partnering with the Jackson Hole WILD to organize an international film showcase focusing on marine species – “Living Oceans Film Showcase”. The film showcase will help raise global awareness of the importance of life below water to our everyday lives, explore the critical challenges facing marine ecosystems, and highlight inspiring solutions. Just in time for Seaweek and our LEARNZ virtual field trip, the Science Learning Hub has published 4 new teaching resources based on Sustainable Seas research, and another will go live this week. This Seaweek, don’t miss your Hauraki Gulf Marine Park poster – free with the Weekend Herald – and Dive Into the Gulf. As well as immersion in compelling artwork by renowned wildlife artist Dave Gunson, the Young Ocean Explorer App will reveal new video content linked to an interactive documentary with videos from Young Ocean Explorers. You can download the YOE App here. The poster will also encourage exploration of dive locations around the Hauraki Gulf and consider some of the issues requiring greater awareness and care. Get yours free in the Weekend Herald this Saturday 3rd March. Useful activity guide for teachers to help them get the most out of this fantastic new book about the New Zealand Seashore. Full of ideas and entertaining and educational activities for students. You can download the activity guide here. Produced by the New Zealand Marine Studies Centre. Find out more about The Collins Field Guide to the NZ Seashore here. From 26 February – 9 March 2018, 20 student voyagers, and 25 adult crew members, will embark on an expedition to the Kermadec Islands on board HMNZS Canterbury. One of the most remote and biodiverse spots on the planet, this untouched region has much to teach New Zealand and the world around climate change and ocean health. Classrooms and students can connect and engage in this Young Blake Expedition by following our blogs, photos, and videos as they come in or you could “Ring an Explorer”. Find out how to schedule a phone call via SAT phone here. This free online professional development webinar, Diving into Marine Resources, is now live online on the Science Learning Hub. The Science Learning Hub is very excited to introduce Steve Hathaway, amazing underwater cameraman and the founder of Young Ocean Explorers, as our guest for this session. Join us in exploring a variety of marine resources, including DOC’s latest marine resources, and listen to Steve talk about his experiences filming in the marine environment. This session will be of interest for both primary and secondary school teachers and valuable when planning for Seaweek (3–11 March) – “Toiora te Moana – Toiora te Tangata – Healthy Seas, Healthy People”. We encourage you to join our discussion about marine education and Seaweek – register in our online discussion forum on Slack. We also have a large number of other Seaweek resources on the Science Learning Hub. All those who answer the questions in the registration forms, attend the live webinars and participate in the follow-up discussions will receive a certificate. Note that you do not need to register in Adobe Connect. You are joining as a guest, so just type in your name and select ‘enter’ to join the session. New from marine restoration group Revive Our Gulf is a worksheet for schools to enable teachers to easily show students the power of mussels as ecosystem engineers and water cleaners. Also included is a dissection guide for a lab class. You can download the worksheet as a PDF by clicking here. The idea is to use the experience that the Trust has gathered in a decade of advocating for marine conservation to gather all the information, documents, case studies, advice and educational resources into one place. This will be an invaluable help and support to communities wanting to protect their marine environment in the future. New for 2018 from the New Zealand Marine Studies Centre is the popular educational colouring book: The Rocky Shore Who Eats Who which has been translated into te reo Māori. Copies of “Te Ākau Pōhatuhatu: Ka kai ā wai i ā wai?” are now available from the NZ Marine Studies Centre free of charge (though there is a small fee for postage and packing. Download the order form. Alternately a PDF file of the book is available to download by clicking here. Plus you can visit the www.mm2.net.nz website to find many other resources, including our shore ID guides, in te reo Māori. The New Zealand Marine Studies Centre team have developed a mobile app so you can look up animals and plants and enter information about what you find in your metre square whilst you are on the shore! Go to www.mm2.net.nz/mobile/ to download the app. It is still in test phase, so let them know how you get on. Check out this brand new guide – it is full of wonderful photographs and information about the habitat and behaviour of New Zealand’s intertidal plants and animals. Essential if you are doing Marine Metre Squared work to help with identification. The Collins Field Guide to the NZ Seashore not only assists with identification of more than 350 species living in the intertidal zones, but explains how these animals survive. From snails and sea stars, to bivalves and brachiopods, each has its own section in the book, making it easy to use. It’s in all good bookshops now and is an essential addition to every home and classroom. Developing compassion and respect for marine mammals is key to what Project Jonah does. They believe children play a vital role in the future of these animals. Because they’re serious about getting the message of animal welfare across, they’ve teamed up with Barbara Todd, to bring the magical world of whales and dolphins to you. Through the World of Whales educational resource kit, Project Jonah will help you teach kids about these animals and their environment, so they can play a bigger part in the protection of marine mammals in the future. See the kit in action here. The kit includes lesson plans on whales and other interactive resources and is FREE to all NZ schools. Read full details about the kit and Barbara Todd – and order your own kit here. You can also click here to download your own Event Poster Template. and here’s an editable version in Word for you to download. The team from LEARNZ have collaborated with the Sustainable Seas Science Challenge to develop a virtual field trip during Seaweek (2-10 March 2019) called “Sustainable seas – essential for NZ`s health and wealth” (Term 1 starting 5 March 2019). On this trip your students will tackle a major New Zealand problem: the conflict between the many uses of our marine environment. There is a growing conflict between these many uses of our marine environment. How can we manage these many uses? How can we meet the needs of Māori, local communities and industry? How do we make sure that we understand our seas, so we care for and use them used wisely now and in the future? On this field trip you will travel to Tasman Bay at the top of the South Island. Here you will join Sustainable Seas researchers who are developing new tools and knowledge to help everyone manage the marine environment. The interviews and resources from the 2018 trip are still accessible on the website, but in the 2019 trip marine scientists will take you through their latest experiments and explain their research findings from the Sustainable Seas research programme. The awesome folk at the Science Learning Hub have put together a special page for Seaweek 2019 here. School pupils can now explore a real-world issue facing New Zealand – how to best manage our vast marine resources – thanks to a collaboration between the Sustainable Seas Challenge and Science Learning Hub. Find the new resources here. Marine ecosystems are critical to Kiwis’ health and wealth. There is increasing recognition that we need to change the way we manage marine resources if we are to sustainably develop our marine economy while protecting the taonga of our marine environment. Ecosystem-based management (EBM) – a holistic and inclusive way to manage our marine environments and the competing uses for, demands on, and ways New Zealanders value them – is a way to do things better. Sustainable Seas is developing EBM knowledge and tools will help marine resource managers, Māori, industry and communities to assess the effect that developing an opportunity will have on the marine ecosystem, other marine activities, our values and our cultural connection to the marine environment. What will the ocean of tomorrow look like? Global warming and ocean acidification have varied and often invisible effects on the marine ecosystem. We rely on the ocean for a variety of resources including food and the air we breathe. We need to understand what these effects could mean for the future health of our ocean – and ourselves – so we can predict, manage and slow down the negative impacts. To increase understanding of these issues, the NZ Marine studies Centre has produced a new teaching resource for high schools. “The Ocean of Tomorrow” is designed to help teachers and educators deliver lessons in the classroom that focus on the impact of climate change and, more specifically, ocean acidification on the marine environment. Working through this booklet, students will act as scientists, carrying out experiments and investigating the effects of ocean acidification on the ocean around New Zealand and elsewhere in the world. The resource book was launched during Seaweek 2017 at a teacher workshop at Logan Park High School in Dunedin. There will be demonstrations of the activities and experiments and Associate Professor Miles Lamare will talk about his research into marine larval response to ocean acidification. Production of the resource book was supported by the Lou and Iris Fisher Charitable Trust and the Ocean Acidification Research Theme based at the University of Otago. Download the order form for the book by clicking here. NIWA have released a new Guidelines on Managing Mangrove (Mānawa) Expansion in New Zealand. As part of Seaweek 2017 the New Zealand Herald published a series of posters produced by the Hauraki Gulf Forum in association with Young Ocean Explorers. You don’t need to live near the Hauraki Gulf to enjoy these Posters. It features many species found around the coastline of New Zealand. They feature many of the animals found in the Gulf’s near-shore, mid-water and deep water environments – and Riley Hathaway! Young Ocean Explorers are excited to provide an awesome Augmented Reality App for free along with the Explore the Gulf posters! Load the App onto your Apple or Android device and add some cool multimedia features to your printed poster! You can also find the App by searching for “YOE Explore the Gulf” in the App store on your device. Inquiry unit | Levels: 1-4 | In the environment: This resource supports outdoor exploration of the marine environment. The activities can be adapted to suit your local context. Unit | Levels: 3-4 | About the environment: Learn about the species that depend on our estuaries – the places where freshwater and saltwater meet. Unit | Levels: 3-4 | About the environment: Learn why a trip to a marine reserve is a great opportunity to study marine life in its natural habitat. Video and unit | Levels: 3-4 | About the environment: Explore the importance of sand dunes and the impact of losing them in this teaching resource. Find out about the largest coastal plant protection programme in the southern hemisphere. Unit | Levels: 3-4 | In the environment: Help your students learn about their local marine environment. View and download the rocky reef resource kit and teaching guide. Factsheets | Levels: 2-4 | About the environment: These factsheets offer students an opportunity to explore the lives of seabirds. There are also lesson plans for teachers. Inquiry unit | Levels: 2-4 | About the environment: This resource is an integrated unit of teaching and learning material about the tāiko/black petrel and other seabirds, for use in primary schools. Did you know that we are loving our terehu (bottlenose dolphin) too much? Dolphin-watching and swimming with the dolphins is an important part of New Zealand’s local and regional economy. Many people are attracted to the Bay of Islands to see them. But only one in four of the Bay’s terehu calves make it to adulthood and there are now fewer than 100 terehu visiting the Bay of Islands on a regular basis. How can we protect these amazing animals and keep them in the Bay? On this field trip during SeaWeek, you will find out about terehu and other marine mammals (kekeno – NZ fur seal, maki – orca, and ika moana – whale). Download the Backgrounder document by clicking here. Fun and Easy: This fun app is so simple any person of any age in New Zealand (grandparent to grandchild) can use it. Fish4all helps you keep a virtual catch log, shows you how others are catching so you can see how well you do and allows you to take pictures and brag to your friends while at sea. Just follow the simple instructions from our cool mascot “Sammy the Penguin”. Click here to learn more. Enhance Fisheries Management: Your data is critical in building a picture of local, regional & national recreational fishing interest. While you are the only one who can see your stats everyone’s information is collated to build appropriate profiles on recreational catch and effort. Click here to learn more. Welcome to Royal cam – streaming live from our northern royal albatross colony at Taiaroa Head near Dunedin. A young albatross pair are currently taking turns on the nest, keeping their egg warm. Look for their colour bands – the male bird has blue-black (BK) colour bands and the female has red-blue-black (RBK). Go to www.doc.govt.nz/royalcam to watch highlights, leave a comment, or ask questions. DOC ranger Lyndon Perriman will be on hand to answer your questions. DOC staff are present daily, monitoring this nest and over 20 others found on Taiaroa Head/Pukekura this season. Northern royal albatross or toroa, have been nesting at Pukekura/Taiaroa Head since 1938, and the colony is now over 100 individual birds. They are one of the largest seabirds, with a wingspan of three metres! A newly published paperback book by South Island writer Joanne McDougall, set mostly underwater in the Southern Ocean and is essentially a there and back chase, as an endangered NZ sea lion tries to catch her dinner. It features penguins, a fearsome shark and other aquatic animals. If you visit my website and go to the book page, you can peek inside. Though the fish, shark and dolphins are just generic and designed to be recognisable, the other animals are species specific and their conservation status is listed in the back. It demonstrates the aquatic food chain in a fun way. Available in libraries and bookshops. The wonderful team at the Science Learning Hub have put together a selection of unit plans and other teacher support materials grouped under possible teaching topics especially for Seaweek 2017. These include a professional development session for teachers. NIWA’s educational resources and scientific data are tools for young people to learn about science. They provide a range of free online resources that cover the ocean, freshwater and coastline that can help you with classes during Seaweek. Algalita Research Vessel – join the crew! Research vessel Algalita has embarked on an expedition to the Southern Hemisphere to investigate plastic pollution off the coasts of Chile and Easter Island and within the South Pacific Gyre. They will be at sea between November 2016 and March 2017. Click here to join our crew! Algalita bridges real-world science with real-time solutions to inspire teachers and students to find their place within the movement to combat plastic pollution in their own schools and communities. Marine scientists are calling on the public to help them get a better idea of the distribution of large brown seaweeds along New Zealand’s coast. Brown seaweeds, including the familiar bull and bladder kelps and Neptune’s necklace, are an important part of the coastal ecosystem. They provide shelter for other species and buffer the coast from waves and erosion. But little is known about their distribution, and NIWA scientists have launched a NatureWatch citizen science project to encourage people to post images and GPS location data for their local beaches. Marine biologist Roberta D’Archino says large brown seaweeds are disappearing from many sites throughout the world, but there is too little data to track their abundance along New Zealand’s coastline. Such a baseline is necessary to monitor any changes in the future for any of the 12 species of brown seaweeds found in New Zealand. Kate Neill, who is also part of NIWA’s coast and ocean group, says large brown seaweeds are underrepresented in museum collections because it is difficult to preserve large specimens in a herbarium. She says the distribution data is only one part of the project. The team also collects the seaweeds to culture them in the laboratory to test them under changing acidity, temperature, light and sedimentation conditions. They are also developing a camera system to monitor changes in seaweed beds in the shallower waters along the coast. The research is funded by the Ministry for Primary Industries. You can hear more about New Zealand’s seaweeds in this Our Changing World story with NIWA’s Wendy Nelson. Visit www.mm2.net.nz to register and become a Citizen Scientist! Did you know there are hundreds of marine-theme activities and resources that you can download free of charge from the NZ Marine Studies Centre website? Board games, crafts, shore activities, posters guides and worksheets – there is something to appeal to all ages. Our stunning new Seaweek 2017 posters & children’s certificates are currently with our fabulous printer sponsor DSP Print Group Ltd getting printed and will be available from 1 Feb. Click here to find out how you can get hold of yours. It’s Sea Week, so here’s Forest & Bird’s new seabird guide, especially for fishers. Download it by clicking here. The flyer features 15 of the most commonly seen (and caught) seabirds in the Hauraki Gulf and Bay of Plenty regions. It includes tips on how to avoid catching seabirds when fishing and ways to safely release them if you do. Would your organisation like extra copies to give away or distribute? If so, email the lovely Melissa at m.irace@forest&bird.org.nz to order your waterproof copies. LEARNZ marine reserves virtual field trip to Goat Island: A 2011 virtual field trip still accessible and relevant to support real sea week field trips or as a stand alone classroom experience. LEARNZ Raoul Island virtual field trip: This 2012 virtual field trip was part of a Sir Peter Blake Expedition and travels aboard the HMNZS Canterbury all the way to the Kermadec Islands. The field trip explores what an ‘expedition’ is, sea life in the sub tropics, catching sharks, looking for whales and lots more! LEARNZ Argo Floats virtual field trip to the Pacific Ocean (Tonga Trench): This 2014 VFT was aboard NIWA’s research vessel Tangaroa to the Tonga Trench in the Pacific Ocean, to deploy deep Argo floats to explore the ocean down to 2,000m. The field trip explores the international Argo Float programme, the world’s oceans, properties of the sea, salinity, analysing data and lots more! The team at Creative Junk have created a special Pinterest Board here: https://www.pinterest.com/creativejunkchc/fish-sea-creatures/ with ideas on making sea creatures out of recycled junk specially for Seaweek! Level: Year 5-8 (year 1-4 resource coming soon – register your interest). For more information and to download the resource click here. 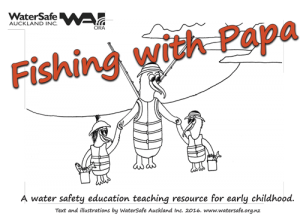 Fishing with Pāpā is a water safety education teaching resource for early childhood from Watersafe Auckland. Wearing a correctly fitting lifejacket when fishing off the rocks or wharf, and when in small boats. You can download your copy of Fishing with Papa free from the Watersafe Auckland website. The format is such that the pages can be can be printed and used as sequence pictures or they could be enlarged and the children write their own story. Fishing with Papa has been produced in support of Seaweek 2016 ’Toiora te Moana – Toiora te Tangata, Healthy Seas – Healthy People’. For more information about this resource or other early childhood education matters please contact Aquatic Educator Lynley Stewart. The Moe Show was filmed at the Royal Albatross Centre in Otago this year and this episode (Series 2, Episode 46) is now available on FOUR Kids website. It is a great introduction to the birds and will appeal to early childhood and young primary students. Ocean conservation is essential but sometimes difficult to understand. The Pew Charitable Trusts joined forces with cartoonist Jim Toomey, the artist behind “Sherman’s Lagoon,” on 10 animated videos that explain the complicated concepts that guide efforts to protect our oceans. Ocean Acidification – What does it mean for Shellfish? Marine biologist Rebecca Barclay provides an overview of the Mussel Reef Restoration Trust’s key project – Revive Our Gulf in this video on the Science and Biotech Learning Hubs website. Rebecca gives us the history of the Hauraki Gulf and how Revive Our Gulf is working to restore some of the original ecosystems. Watch the video from this primary and secondary professional development session to find some resources for Seaweek using the Science Learning Hub. These sessions will help you to find your way around the Science Learning Hub while tracking down teaching content for Seaweek 2016: Tolora te Moana – Tolora te Tangata – Healthy Seas, Healthy People. Included will be our upcoming new story – Young Ocean Explorers, featuring Riley and Steve Hathaway. Their recent video series is supported by the book Love Our Ocean that was been sent out to every school in New Zealand. Recently Genetics Otago and its partners, Otago Polytech, Otago Museum, the NZ Marine Studies Centre, Orokonui Ecosanctuary and Icon Logistics, received some government funding to develop a mobile science lab to help with STEM teaching in rural schools and communities. Starting in Term 4 this year, the aim is to visit schools with the laboratory, and work with students and teachers helping them discover how science works and what scientists do. Initially Lab in a Box will be visiting primary, intermediate and area schools in South Canterbury, Westland, Otago and Southland. Ultimately, the aim is to run programmes with secondary schools as well, and to make it available across the whole of New Zealand. Experiencing Marine Reserves – Mountains to Sea Conservation Trust have released a really cool app for your tablet or cellphone that allows you to visit a marine reserve without getting wet! Snorkel around a healthy site and an unhealthy one to see the incredible difference no-take marine reserves make to the biodiversity of our seas. Brand new resource from the New Zealand Marine Studies Centre. Available for download by clicking here. A free guide for teachers from Watersafe Auckland Inc. for you to download here. The NZ Marine Studies Centre provides this guide to what lives on our sandy and muddy shores. Complements the Rocky Shore Guide and perfect for doing Marine Metre Squared on beaches and estuaries. You can download an electronic copy here, or order hard copies by downloading and completing this form. There are lots of free marine resources available for download from the NZ Marine Studies Centre website. The New Zealand Sea Lion Trust are offering a FREE education resource package for primary, intermediate and scondary school teachers or youth group/interest leaders. Download your pack by clicking here. Members of the Trust are also available to come to your school/youth or interest group to give a talk about the latest research and issues. Watch the video and download the Fish Seabird Smart recreational fishing card from Southern Seabird Solutions Trust to help you avoid and deter seabirds from getting caught on your gear, and what to do to release them unharmed if they do. Contact kirsten@southernseabirds.org if you’d like a laminated version for your tackle box. An easy way for anyone to survey the plants and animals living on their local seashore. A new guide for soft shore sediments (mud and sand) is being developed and will be launched during Seaweek 2014 to complement the currently available Rocky Shore Guide. Visit mm2.net.nz to register and download all the resources you will need to do your own seashore surveys. Educational units for teachers – While they have a Canterbury flavour to them, many of the ideas are generic and could be used throughout New Zealand. They are entitled: The Rocky Shore (2.3MB), Coastal Wetlands (1.7MB) and Coastal Dunes (1.1MB). Download by clicking on the links. History and Traditions of the Sea – The sea is important for many people in New Zealand. However, over the years the uses and traditions have changed significantly. This guide looks at transport, fishing and the recent increase of recreational activities. Download it here. Plus more resources in the Teachers Toolbox. Starfish (years 7-10) and Fish for Tomorrow (years 4-6) are free resources for teachers from the Ministry of Primary Industries to help students explore the role they can play in making sure there are fish for tomorrow. Download the factsheets for Starfish from the website at www.fish.govt.nz or email education@fish.govt.nz for a DVD and resource pack. Te Kete Ipurangi: Teaching resources and education for sustainability links and help. Check out the resources by going to the EFS kete, curriculum resources and tools and finding the Ministry of Education NCEA resources page, looking under Teaching Tools. End of the Line: Information and activities related to Fish for the Future and the End of the Line movie. LEARNZ: Interactive student experiences and a collection of New Zealand, contemporary digital resources for education. Fairfax Media Resources for Schools: including Marine and Environmental resources for students from Year 1 – 10. Marine Metre Squared Project: an easy way for anyone to survey the plants and animals living on their local seashore. Underwater Cleanups – Divers visit www.projectaware.org/cleanup to register a cleanup event and receive tools to help make your underwater cleanup a success.